The European Training Network ALKATRAS is embedded into an established international research programme: The European Research Initiative on Anaplastic Lymphoma Kinase (ALK)-related malignancies (ERIA; www.erialcl.net), which is an existing and functional network of 13 research partners. ERIA was instigated to coordinate research into ALK-related malignancies to facilitate the development of less-toxic and more efficacious therapies. ALK is increasingly recognised as a prevalent oncogene in a number of human malignancies and therefore poses a prominent clinical problem, which requires coordinated research into its oncogenic mechanisms. ERIA now conducts a collaborative multidisciplinary research programme at the interface of biomedical and bio-mechanistic approaches, which will be an excellent environment to train the next generation of European scientists. Within the EU-funded ETN ALKATRAS this consortium will cosset and nurture a cohort of 15 early stage researchers to become confident, competent, independent and well-connected European scientists with excellent career perspectives. The recruited fellows will be incorporated into international academic study groups (all partners of the ERIA network) to perform high calibre research and also will be exposed to environments from other sectors to broaden their experience. The 15 recruited fellows will be incorporated into international academic study groups (all partners of the ERIA network) to perform high calibre research and also will be exposed to environments from other sectors to broaden their experience. Secondments will include technical training within individual laboratories and SMEs (TissueGnostics, Galkem, Cambridge Life Sciences, Sofigen and Varionostic) as well as large Pharma (Roche). Training through research will be complemented with a balanced programme of transferable skills and access to local courses. The training of each fellow will be guided by a personal career development plan and supervised by a PhD committee. The primary goal of the network is to train the recruited fellows by participation in an internationally competitive research programme and integrating them into an international network. Thereby providing competence in state-of-the-art research and development at the forefront of translational science. 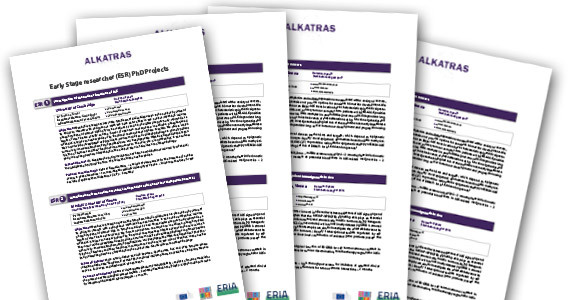 The European research initative on Anaplastic Lymphoma Kinase (ALK)-related malignancies (ERIA) launched the EU-funded PhD programme ALKATRAS.